There's an interesting story behind our anatomical human eye keychain, a concept that I had pondered for more than a decade before it was finally realized! The story begins with the first anatomical eye, a piece that I carved in the early days of TaylorCustom. At that time, I was working at the Boston Science Museum, where there was a "frozen shadows" exhibit, which used a strobe-light to capture shadows on a wall made from a photosensitive material. I thought it would be cool to layer some of this photosensitive material on the retina of my eye keychain, and to put a real lens in the eye so that inverted images would be captured... Alas, I lacked the technical wherewithal to realize such a project, and so it lay dormant. Years later, as computer modelling and 3d printing technologies improved and became familiar to me, I began to revisit some old, unrealized projects. One day, while having lunch with an engineer whose wife worked with optics, I posed the concept. As it turns out, no optics expertise was needed... he held my old keychain up to his eye, and suggested that I simply put a hole in back. This solution was much simpler and more elegant than layering the retina with a photosensitive material, and so a long-standing design conundrum was solved summarily. Eureka! Without delay, I ordered lenses for prototyping, however when I tried these lenses out, the image I saw was hopelessly blurry. What was happening, as the helpful folks at Edmund Optics explained, was that I needed a second "Eyepiece" lens, to "re-collimate" the light. 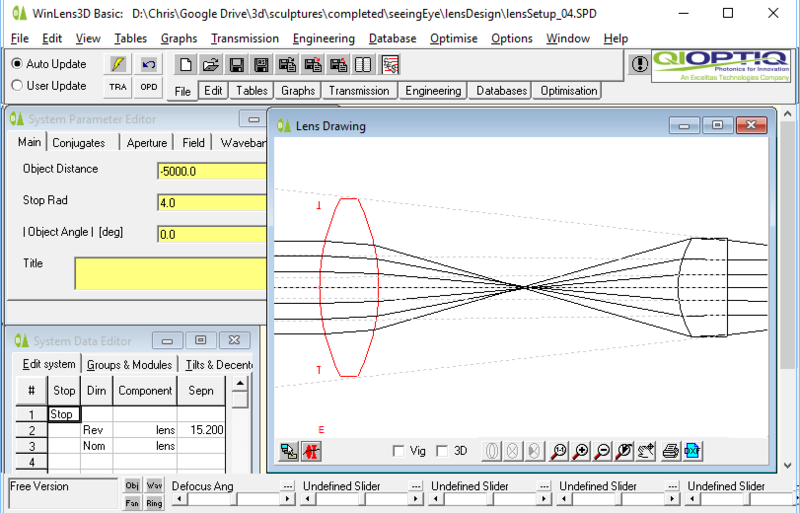 With much ado (including a week unnecessarily spent learning to use optical design software), I eventually figured out what lenses would work... but knowing what I needed was only the beginning! When sourcing lenses for most applications, I would guess that the main difficulty is usually one of being spoiled for choice, however this was not my experience. While lenses seem to be available in every imaginable diameter and focal length, most are not suited to be used in a product that would retail for less than $40. To loosely paraphrase a friend: "the words "inexpensive" and "lens" just don't seem to go together! 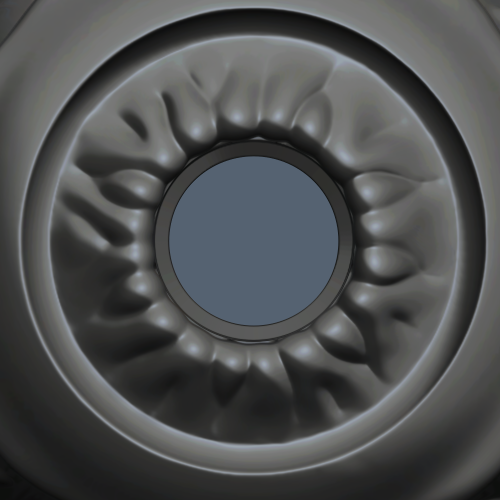 When the sourcing of lenses was at last resolved, it was time to begin the design phase. The first consideration was how to section the eye, to show its internal anatomy. 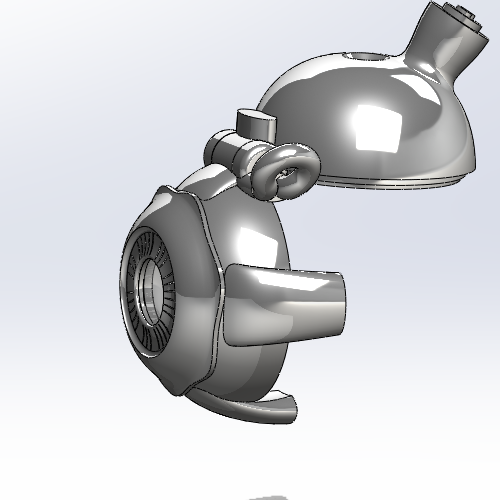 Using SolidWorks, a popular mechanical CAD software package, I tried both obvious options, a medial section, and a frontal section. 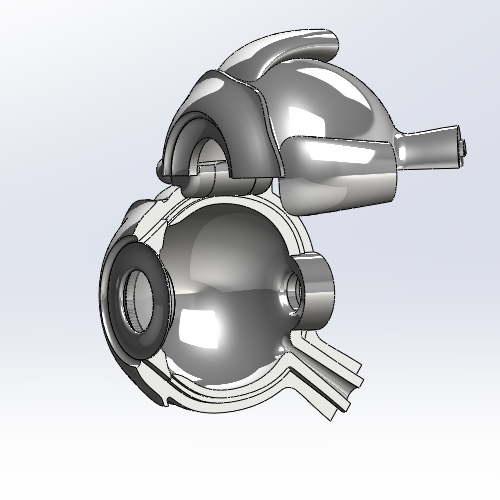 The medial section (on the right), showed the eye's structure to better effect since it cut through the optic nerve, however a variety of aesthetic and manufacturability concerns favored the frontal section (on the left), and this is what I chose. 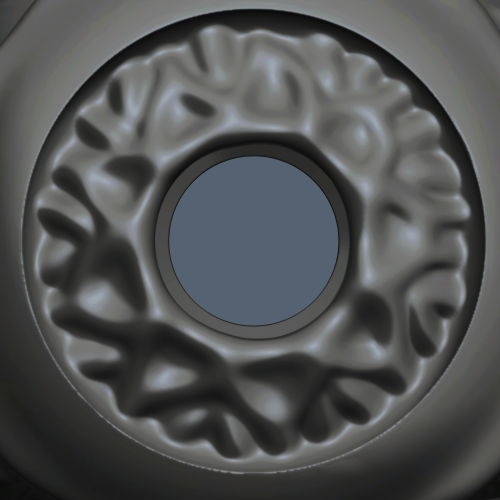 Once the mechanical portion of the design was completed, I brought the CAD model into another software package, 3d-Coat, which is well suited to modelling the blood vessels and other organic details. A lot of research was needed at this stage, since diagrams available on the internet are often simplified, and frequently they contradict one-another. I recall spending a long time figuring out how to arrange the vorticose (vortex) veins on the outside of the eye (these vary in number from person to person). The images on the right show a couple of the many stylized representations I considered for the iris (a structure that is difficult to realistically portray in cast pewter). 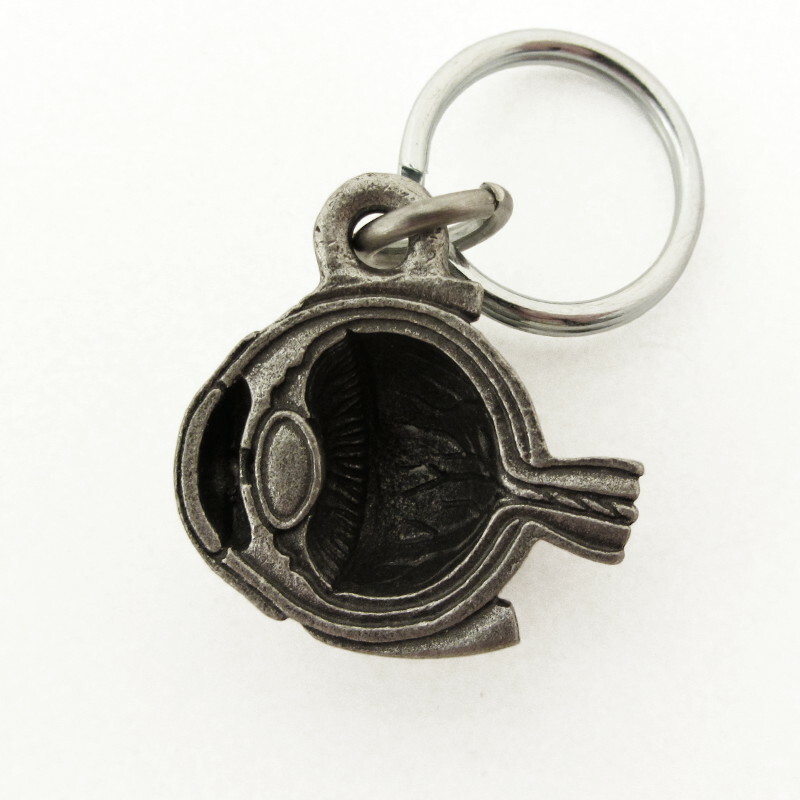 And that (ignoring a few boring weeks perusing lens catalogs and such) is the story of the Anatomical Eye Keychain!